An old post, with an old thread. "I shall never forget the first time I went into S Mary Magdalen's, there were two priests hearing confessions, a Mass was being said at one of the altars, and there was Exposition of the Blessed Sacrament in the Lady Chapel". I remember analogous remarks being made about the scenes in Alyoggers, the Oxford Oratory, during the Visit there in 2010 of the Relic of S Therese. They call to my mind the scene described by Newman towards the end of Loss and Gain: "There were side-altars - perhaps half a dozen; most of them without lights, but even here solitary worshippers might be seen. Over one was a large Crucifix with a lamp, and this had a succession of visitors. They came for five minutes, said some prayers which were attached in a glazed frame to the rail, and passed away. At another ... over it was an image. On looking attentively, Charles made out at last that it was an image of our Lady, and the Child held out a Rosary. Here a congregation had already assembled, or rather was in the middle of some service ... Reding turned his eyes elsewhere. They fell first on one, then on another confessional, round each of which was a little crowd , kneeling, waiting every one his own turn ... the men on one side, the women on the other ... the growing object of attention at present was the High Altar [which was being prepared for Benediction]... "
Come to think of it; isn't this a bit like a Greek church with members of the congregation sauntering around to their favourite ikons? The one I used to attend in the Camberwell New Road seemed, whenever I peeped out from behind the iconostasis, terribly 'busy'. I think busyness attracts; is 'evangelical'. Not least because it helps the random visitor to feel un-self-conscious. What on earth were you, as a non-Orthodox, doing on the other side of the ikonostasis? "In the church, Clement and the community of five Redemptorist priests and three lay Brothers began what they called the Perpetual Mission. Instead of having just a morning Mass in the church on a weekday, they had a full-scale mission every day of the year. You could attend St. Benno's every day and know that you would hear five sermons in both German and Polish. There were three high Masses, the office of the Blessed Virgin Mary, public visits to the Blessed Sacrament, the Way of the Cross, vespers, prayer services, and litanies. And priests were available for confessions all hours of the day and night." 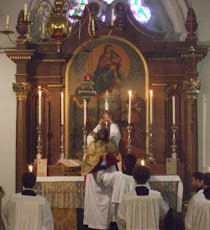 I do remember one comment: while all the sermons were being preached, there was always Mass going on at the altar, lest the people be deprived of the chance to attend the Holy Sacrifice. My impression was one of concentrated and dynamic LIFE, which, with all their beauty and decency of worship, the greatest of Anglican cathedrals lacked for me. Nowadays, most churches are locked outside service times, and those which are open, are disturbed by sightseers who come as consumers, rather than the worshippers who fill the air and fabric with their prayer. "Busyness...helps the random visitor to feel un-self-conscious." Excellent! And who is to say that a few moments in sincere and awe-struck prayer before a little shrine is not more precious in the eyes of God that an hour bolt-upright in a pew "paying attention"? I trust you didn't peep out of the Holy Doors but used the side ones. When last at Westminster Cathedral, while regretting the absence of sundry Masses at the side altars, I did notice many a body praying in the different chapels: there was a quiet presence of spiritual life. B flat, I do not mind too much the sightseers; was not Zacchaeus a sightseer? There is some mischief in the notion of 'the gathered church', a trajectory of the 're-discovery' of the Church as the People of God. Authentic 'church' in this way of thinking is self-awareness as the gathering of God's people. The more people the better. Thus the Eucharist displaces all other services (Vespers, Matins), and the Sunday Eucharist displaces all other Eucharists (early, late, weekday, festal, memorial). It is being all together that is so important, after all! Everyone needs to be a part of everything. And if they can't, well perhaps Father shouldn't be undertaking such counter-intuitive things in the first place. Why would you have Liturgy on a minor feast, for a just a couple of souls? Better put your efforts into the Really Big Show. In practical terms, where this gathered people of God ideology has taken root, one tends to find fewer services and a less welcoming (aka usually locked) facility. A healthy parish, on the other hand, is as full of 'holy busyness' as time and resources will permit. Lots going on, at all hours, and even simultaneously. It is precisely living, organic, personal, intimate, particular, local. This description is much like what I still find in St. Patrick's Cathedral in New York. Why is it that village priest seems to say what I wanted to say, but to say it so much better? I think it the other way around, at least the very good sense of Fr Hunwicke usually triggers some thought deeply felt but not always understood or articulated. Thank you. Recently, in Spain, no priest turned up at either advertised time for confession. At Eng Martyrs, Cambridge, on a Tuesday, two priests were hearing confessions five minutes before the advertised time!